Many construction projects involve poor soils. New road projects frequently encounter areas where soils have inadequate load-bearing capabilities. Often, too, reinforcement is required to provide stability for steepened slopes. Conventional design in slope construction demands either space-wasting gradual slopes or expensive cantilever walls. In road construction, it is often necessary to improve the low weight-bearing capacity of poor sub-soil by using thick layers of expensive granular fill material. Today's geogrids make it possible to build extremely stable earthen structures at much lower costs than older construction methods. 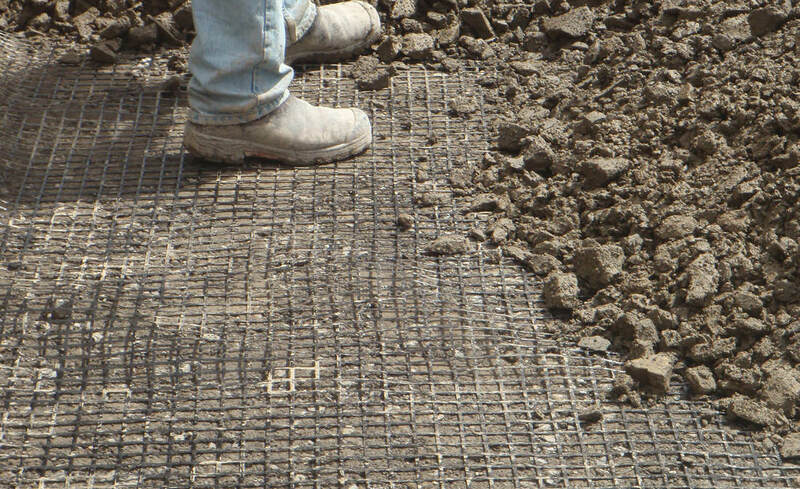 Geogrids are net-shaped synthetic polymer-coated fibers that are used to reinforce earth-fill slope, wall and base layer construction. Incorporated in the base layers of paved or finished surfaces, or in surface layers of walls and slopes, they provide a stabilizing force within the soil structure itself. This stabilization occurs as the fill interlocks with the grid. The interlocking effect is determined by the geogrid strength, mesh size and base materials used. Slope Reinforcement: Highway embankments, overpasses, landslide or erosion-prone surfaces and landfill walls. Base Reinforcement: Foundations for roads, parking lots, railroad track beds, airport tarmacs and runways. Wall Reinforcement: Retaining walls, airport noise barriers, bridge supports and sea walls. Berm Reinforcement: Spillway channels for earthen dams, levees and waste containment ponds.